Chihuly at Biltmore, the first art exhibition in our historic gardens, features dramatic, large-scale glass sculptures by artist Dale Chihuly. From stunning works of glass art in Biltmore's collection to the glassware in which you taste Biltmore wines, glass is a glorious medium that can be both decorative and functional, often at the same time. "As we celebrate the importance of glass at Biltmore," said Jill Whitfield, Wine Marketing Manager, "we are delighted to share the release of two new wines: Vitrus™ White, a refreshing blend of Roussanne, Marsanne, and Viognier featuring a fragrant bouquet and notes of kiwi and pineapple, and Vitrus™ Red, a bold, fruit-forward, blend of Petite Sirah, Zinfandel, and Syrah featuring notes of blueberry, vanilla, and spice. 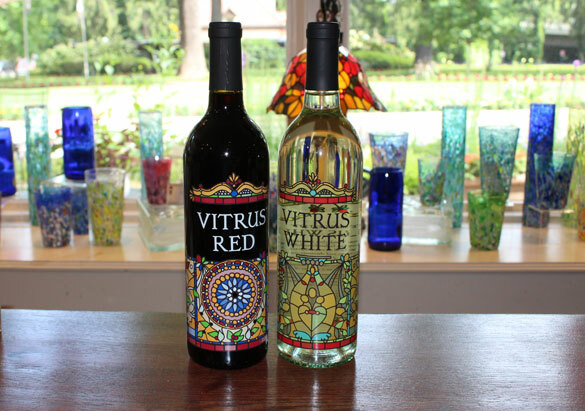 Both wines are inspired by artwork commissioned by George Vanderbilt's father William Henry Vanderbilt." 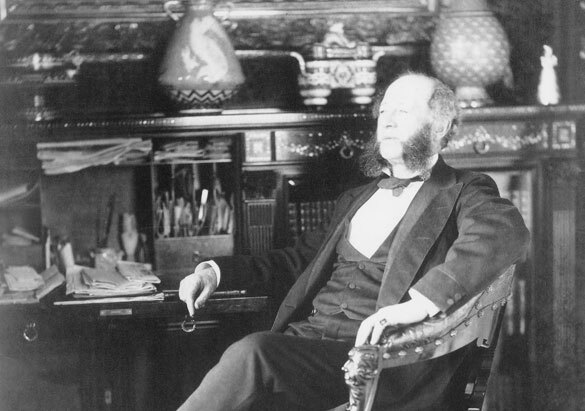 In 1879, William H. Vanderbilt built a grand home on New York’s newly fashionable Fifth Avenue. 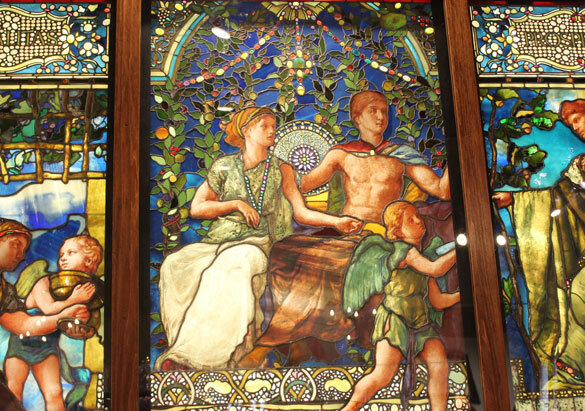 In addition to splendid interiors created by the acclaimed design firm Herter Brothers, W. H. Vanderbilt commissioned artist and interior designer John La Farge to create several stained glass panels for the central stairwell of his new home. Considered to be among La Farge’s finest work, the set of three triptych windows known as The Fruits of Prosperity showcase his experimental techniques, which influenced the work of another famous stained glass artist, Louis Comfort Tiffany. One set of three windows known as Hospitality and Prosperity symbolically represent the success and contributions of the Vanderbilt family. In the center, a young noble couple is enthroned beneath festoons and garlands of jewels. On the left, Hospitality is represented by a kneeling figure under a grape arbor preparing a banquet with the help of cupids carrying vessels of wine. On the right, Prosperity is portrayed by a majestic figure offering a cornucopia of coins. George Vanderbilt inherited the house at 640 Fifth Avenue in 1896 after his mother’s death. During renovations in the early 1900s, he had these windows removed and stored for safekeeping, and they became part of Biltmore's collection. When George Vanderbilt's grandson William A. V. Cecil returned to Biltmore in 1960 to manage the estate, he was looking for ways to preserve the property and his family's legacy. One of his major initiatives was the creation of a vineyard and a winery to complement his grandfather's French Renaissance-style chateau and and his vision of agricultural programs that would promote self-suffiency. When Biltmore's Winery opened in 1985, the La Farge windows were initially used in the Tasting Room, but later removed to prevent possible damage due to their age and fragile nature. Twenty-five years later, the Hospitality and Prosperity trio of La Farge windows once again saw the light, first in The Biltmore Legacy in Antler Hill Village, and then in the Winery where they remain on display today. 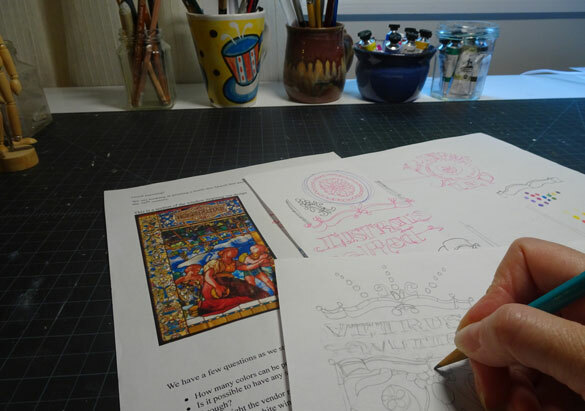 "The craftsmanship and the beauty of the stained glass is astounding," said Jill, "and it inspired us to create our two new Vitrus wines that honor La Farge’s groundbreaking techniques and Vanderbilt’s legacy as a patron of the arts." 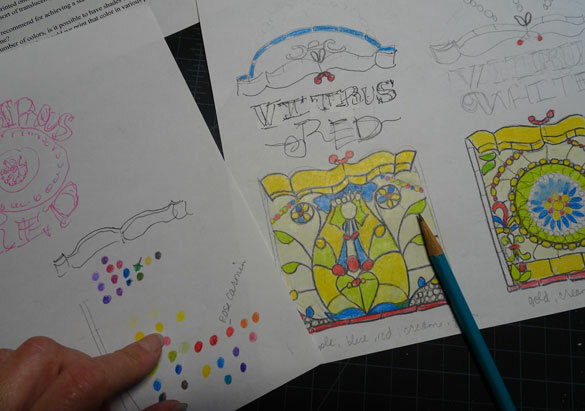 "With the La Farge windows as inspiration, we created the Vitrus labels in a stained glass style. 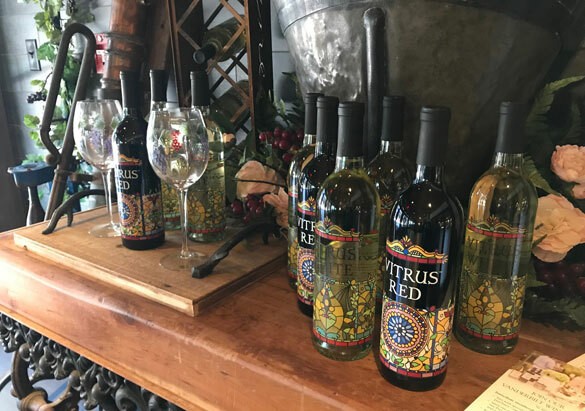 It looks almost as if the bottles are works of art, and the wines inside the bottles are certainly handcrafted to be masterpieces," Jill said. 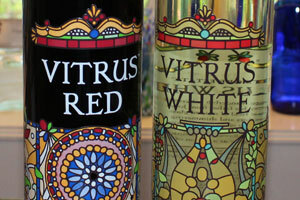 Purchase Vitrus White, Vitrus Red, and any of our other fine wines online or at the estate.